Jim is a Piccolo, Sunstream and Cocktail Tomato grower, based in Dublin. Find out more by taking a virtual video tour of the farm. I’ve been growing tomatoes since I was 16 years old. I started off growing tomatoes in Haggardstown nursery outside Dundalk and after developing a real love for growing, I attended horticultural college where I learned my trade. In 1978, I moved to Swords and the business has expanded from there. We now grow four different varieties of tomato – cocktail, cherry, sunstream and piccolo. 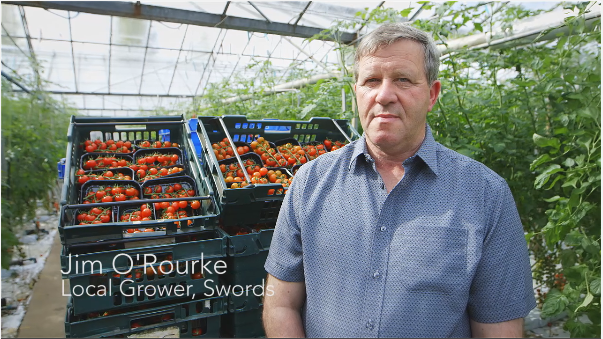 We’re one of only two growers in Ireland to have a licence to grow piccolo and one of only a handful of growers in Europe, so we are very proud of this particular tomato. Piccolo is a distinctive variety because of the way it looks and the way it tastes and that’s what makes it so special. In the greenhouse, we use the latest technologies and nutritional analysis systems in order to ensure the plant has the correct amount of nutrients to grow healthy. If you give the plant what it wants, it grows happy and this leads to a better quality product. We’re only 5 minutes from our local depot and because we’re so close to our markets, we can allow the tomatoes ripen on the vine. This improves the flavour of the crop and that’s really what it’s all about. If you grow a product that the customer wants, with a superior quality and taste, then the business end of things looks after itself and that’s my simple philosophy! Total Produce is very supportive. I have the expertise in growing and they give me the space to do what I do best. Total Produce is a genuine company who want this business to succeed and we work together to grow top quality produce that’s local. I am situated in the heart of North County Dublin in Swords. I am located only 20 minutes from Dublin City Centre and 5 minutes from the nearest Total Produce depot.